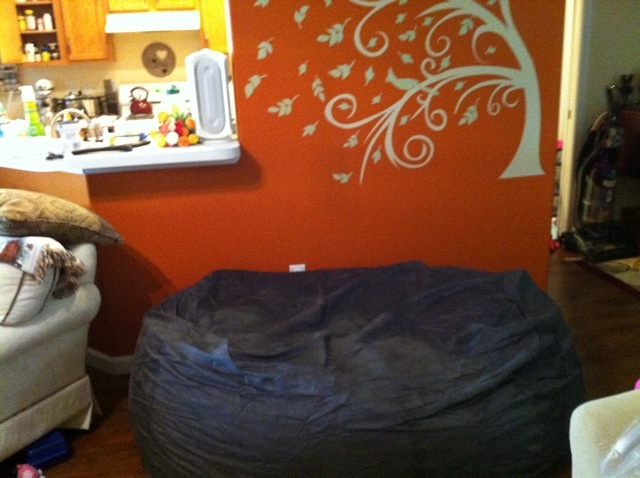 Final Update: I’m not sure what it is about the Comfy Sac, but the foam is just so…uncomfy. 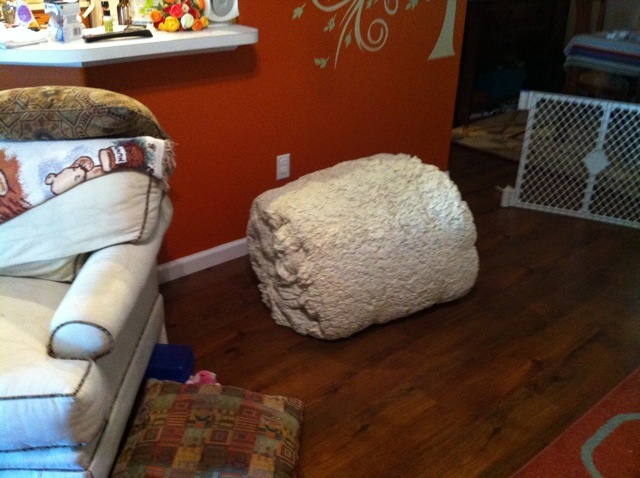 There is something about the material that just feels awful and though our kids love jumping on it, as a piece of furniture I’m to the point where I am ready to sell it to just get it out of my house. 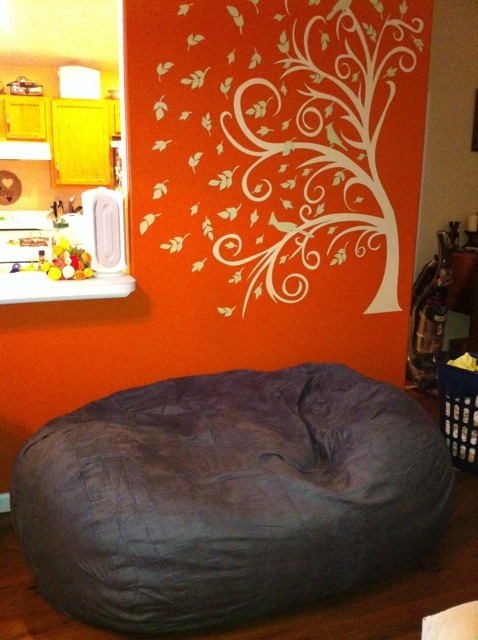 It is amazing how it is a microfiber like our Love Sac, but it just feels completely different. 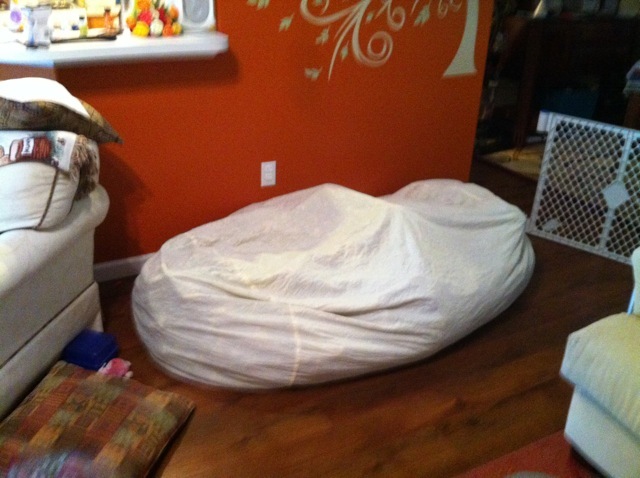 Even if I don’t fluff the Super Sac and it gets compacted into what resembles a giant dog bed, it is still comfortable. The Comfy Sac I’m afraid was a bust for us. It is amazing how quickly we went from love to hate. Now, I’m trying to convince the kids to let us get rid of it. I had spoken to customer support once about the fabric and they told me to wash it so the pile would not be squished down. There was no difference in feel, I think it is just a bad fiber blend. Their newer ones may be made better I’m not about to test that theory with any more money. Update 2: Nearly one year later and I have to say the Love Sac wins hands down. When we moved out of state we splurged and got the Super Sac. When it comes to fabric quality and comfort, the difference is huge. We delegated the Comfy Sack to the basement where the fabric attracts every little bit of dust. The fabric is so thin it is looking really icky and worn and does spend most of its time being covered by blankets still so I can’t imagine why it looks the way it does.The foam feels icky now too. For a piece of furniture that isn’t used that much it is a shame that it is wearing so poorly, it looks like something one would buy at Walmart. I’m very disappointed in the fabric. Update: One Month Later and we still enjoy this. However, I do wish the fabric was thicker. 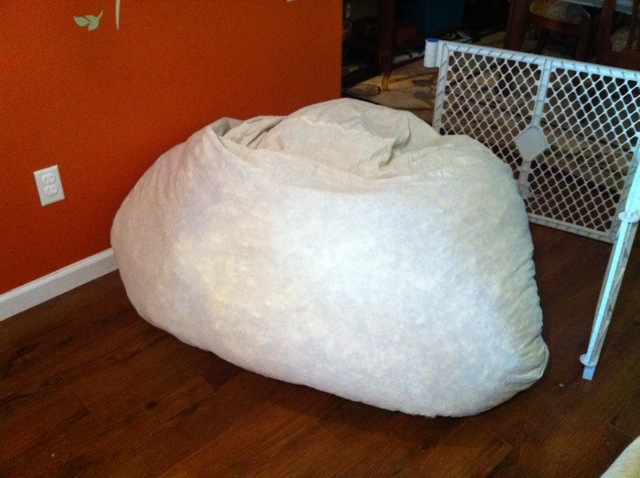 Currently we have a blanket and a comforter on top of it to shield it from acts of toddler, but compared to our Love Sac, the material is so so much thinner and it wrinkles like crazy. I really wish I went with a different fabric to be honest. We finally decided to go with the 6 foot lounger and it arrived today. First off, I do not recommend trying to open up a sack and fluff it the day after doing your first ever massive ab workout, because of course that is what my brilliant self did. The 6 footer is about 50 lbs and it is definitely a workout in getting this bad boy up and running. Basically, you open it up, break up the big chunks and then pop it in its cover and it reaches 90% of its full fluffy potential within 24 hours. 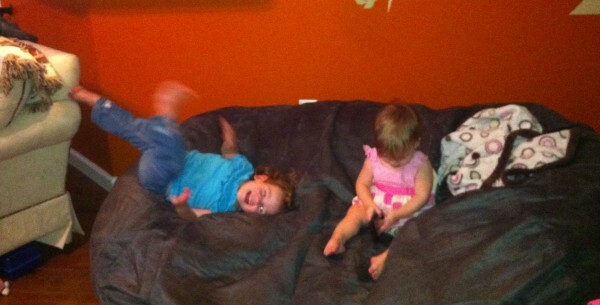 Now one of the big differences between Lovesac and Comfy Sacks is the foam that is used inside. My Pillowsac had some big chunks of foam that had almost a papery texture. They very kindly sent me more foam and we added extra and removed the papery chunks but we did have to tear up the big chunks by hand. 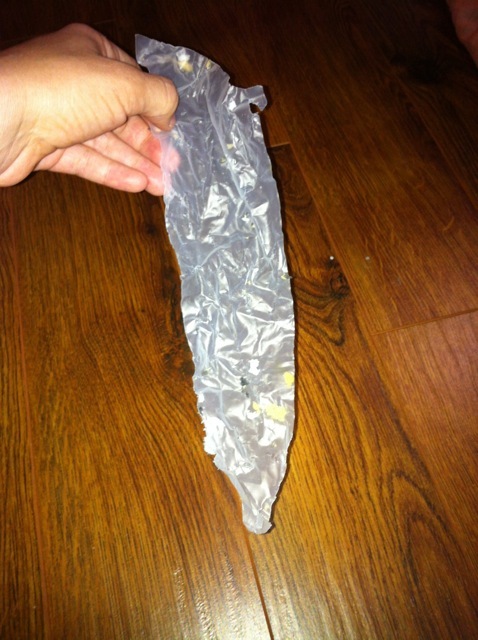 The Comfy Sack’s foam has smaller chunks…which I found out because of this. 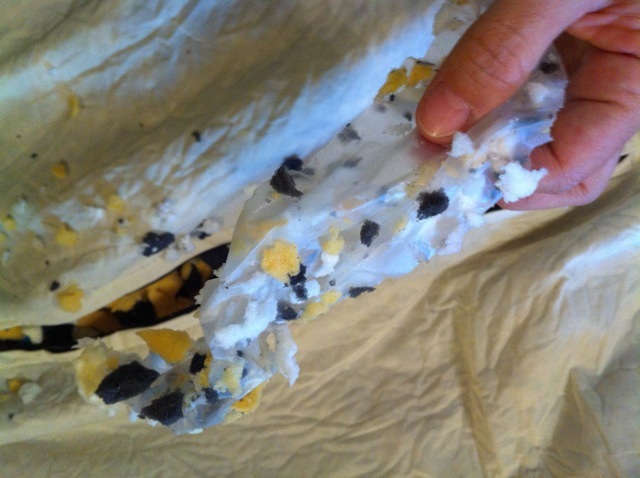 I am sending these pictures to our factory however it looks like what that is is the outer film of the foam that is used during the ‘cooking’ process to make the foam expand. With the huge amount of foam that we process this film sometimes makes it into the foam however we strive to make sure this film does not end up in the product. We use the highest quality foam in the business and anything that challenges the comfort of the product is something we take very serious. They did offer to replace the liner, but I declined since it was not that big of an issue, although I did appreciate their response. As to the zippers, the liners now have regular zippers on them instead of a one way locking type zipper like the LoveSac so I’ll need to zip tie them together so the niblets can’t have their own foam party. After I got the lounger in a cover, it started to expand pretty fast. Here it is an hour after being opened. The fabric is nice and soft and the charcoal complements our existing decor rather nicely though I was sad that the Polar Fox didn’t come in our size. We thought about the Comfy Cords, but it seemed like it would attract dog hair a lot easier and I didn’t want the girls to pass out on the lounger and end up with waffle face. With the Micro Suede, I’m a little worried that the girls may rip the cover rough housing since they’re not exactly dainty about….well anything (and I have the bruises to show for it since Mommy = best climbing toy ever) and the fabric feels a bit on the thinner side. However, I figure worse case scenario, they do sell replacement covers and to be fair while the fabric on our PillowSac is really gorgeous, we hide it under a blanket for fear the niblets will pee (spit up/various other fluids) on it because we’re not 100% sure of its machine washability. So far we really like sitting in the lounger and if it holds up well in the next couple of months, we may consider replacing our big couch with the 7.5 footer since it would be give me a lot more piece of mind the next time the girls attempt to do front flips from the couch (sigh). So far we have fit me and my husband on it along with two wiggly girls (in tight quarters) but before we go essentially sans a couch, I want to put it through our kid testers. I tried to take a better picture of the niblets on it to give a scope of the size but all the photos look like a Bigfoot sighting since they wouldn’t stop jumping on it long enough to actually show up without trails (so a compliment).